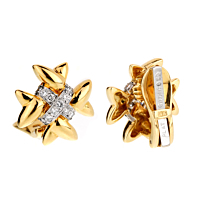 A classic Tiffany & Co style, these gold diamond cross stud earrings feature a combination of high polished 18kt yellow gold, platinum and diamonds. The geometric cross design in yellow gold is adorned with platinum crosses set with brilliant round diamonds. The solid clip-on feature is crafted of both yellow gold and platinum.